Thompson also noted that while the agency is relying on its 510(k) regulatory pathways in the meantime, the heterogeneity of these nontraditional tools has resulted in an ever-growing number of De Novo clearances and device classifications. Below, MobiHealthNews has collection of 12 algorithm clearances — five De Novo, seven 510(k) — spanning the breadth of digital health. Viz.ai’s Contact is a clinical decision support (CDS) tool that analyzes CT results and highlights cases that may have experienced a stroke. 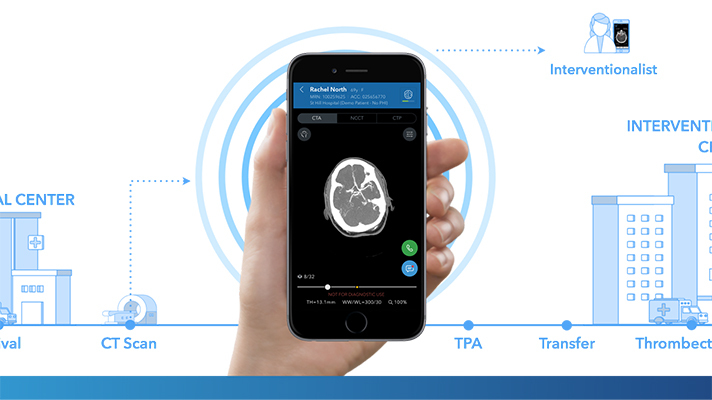 Approved through the agency’s De Novo premarket review pathway, the software uses an AI algorithm to scan CT images for indicators associated with stroke, and then sends a text notification to a neurovascular specialist if it identifies a potential large vessel blockage. Because the tool alerts the specialist during the time a first-line provider is reviewing the images, patients may receive attention from a specialist earlier than they would normally. Contact is not intended to be a stand in for a full patient evaluation when diagnosing a case. Imagen’s OsteoDetect uses an AI algorithm to scan X-ray images for a common type of wrist bone fracture, known as distal radius fracture. The software can be fed images of adult wrists in the posterior-anterior and medial-lateral position, and using these highlights regions with potential fracture. OsteoDetect — which received De Novo clearance in May — is intended for use by primary, emergency, urgent and specialty care practitioners alike, but should be accompanied by a standard clinical review. Bay Labs’ EchoMD AutoEF software assists cardiologists by using an algorithm to automatically review relevant digital video clips collected from an echocardiography study, rates their quality and then selects the best to calculate ejection fraction, a key measure of cardiac function. Of note, the software can be integrated into a cardiologist’s routine diagnostic workflow to better assist decision making. In February, medical imaging software company Arterys Inc. touted 510(k) clearance for its Artyrys Oncology AI suite, a web-based platform that helps clinicians analyze ARIs and CT scans for signs of potential liver and lung cancer. The tool uses deep learning algorithms to expedite interpretation of these images.